This year's 10km route starts and finishes in Kinsale town centre, the road route show cases some of the most breath taking coastal views along the way. On Saturday February 17th there will also be a pop up registration and information day held in the town at Smith’s Super Valu and O’ Connor’s Pharmacy 10.00 – 4.00pm . You can collect your t-shirt and race number at the Check-In Desk in the Temperance Hall (Kinsale Town Centre) between 12.00 pm and 6.00 pm on Saturday April 7th or between 10.00am and 11.50am on the morning of the walk Sunday April 8th. €60 can offer four lifts for a cancer patient, taking them to and from hospital for chemotherapy treatment. 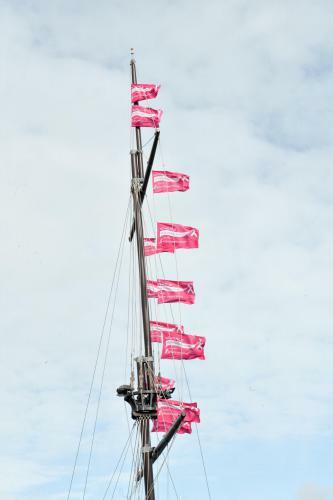 For further information or to register online, please visit www.pinkribbonwalk.ie or contact us at Kinsale@pinkribbonwalk.ie or Pink Hotline 086 2719556 . Action Breast Cancer - www.cancer.ie or free helpline 1800 200 700. The medieval town of Kinsale is not just about food. It is also about traditional bars, beautiful buildings, narrow streets, shops and galleries and lots of activities on land and sea. You'll find Kinsale is not just a place - it is more a state of mind. Kinsale Chamber of Tourism has all the information about the town, places to stay, eat, drink, shop and enjoy yourself. is situated in heart of the colourful historic harbour town of Kinsale also referred to as the Gourmet Capital of Ireland. Actons is the oldest hotel in Kinsale originally established in 1946 by two sisters, Sidney and Shelia Acton and since then has become an integral part of Kinsale town. After a substantial renovation in 2012 the hotel re opened in March 2013. The Blue Haven Hotel is a boutique-style hotel situated right in the centre of Kinsale Town. With its town centre location, Jim Edwards offers doorstep access to the vast array of amenities that the charming town of Kinsale has to offer. Our newly refurbished B&B is the ideal place to stay when visiting Kinsale and our bar/restaurant is the perfect place to enjoy a delicious meal. The Edwards family and its staff are always on hand to help and advise guests on the various leisure activities available in the area, including golf, horse riding, deep-sea fishing, nature and historical walks etc. Our aim is to make sure your stay with us is made as pleasant as possible. Contact info@whiteladykinsale.ie for more details. Contact info@tierneys-kinsale.com for availabilty and rates. 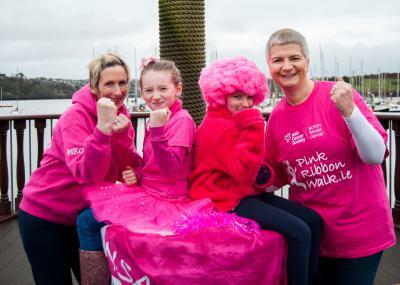 -F.A.Q: What is the Kinsale Pink Ribbon Walk? -F.A.Q: Who can take part in the Pink Ribbon Walk? -F.A.Q: How much does it cost to take part in the Walk? -F.A.Q: How fit do I have to be? -F.A.Q: How do I enter? -F.A.Q: How much sponsorship do I have to raise? -F.A.Q: Can I get advice on how to raise funds? -F.A.Q: Where do I get my t-shirt and race number? -F.A.Q: How do I hand in my sponsorship money? -F.A.Q: Can I help publicise the event? -F.A.Q: If I can't take part in the event, is there another way that I can help? -F.A.Q: What time does the Walk start? -F.A.Q: How do I get to the Town Car Park? -F.A.Q: Will car parking be available? -F.A.Q: What is the route like? -F.A.Q: What should I wear? -F.A.Q: What support will I be given on the route? -F.A.Q: Will there be any toilet facilities available? -F.A.Q: Will there be any food or refreshments provided? -F.A.Q: Will litter bins be provided? -F.A.Q: Where does the Walk finish? -F.A.Q: What will happen when I finish? -F.A.Q: Is there somewhere nearby where I can stay? -F.A.Q: Is the Walk accessible for wheelchair users? -F.A.Q: Can I bring a pushchair? -F.A.Q: Can I bring my dog? 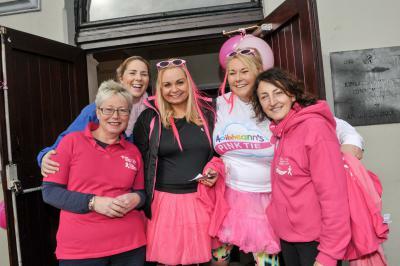 -What is the Kinsale Pink Ribbon Walk? The Pink Ribbon Walk is a fundraising event for Action Breast Cancer, a programme of the Irish Cancer Society. The next Kinsale Pink Ribbon Walk takes place on Sunday April 8th 2018. The Walk route is circular and approximately 10km in length. -Who can take part in the Pink Ribbon Walk? The Pink Ribbon Walk is open to those of all abilities. And it's not just for the girls - men are welcome to take part too! 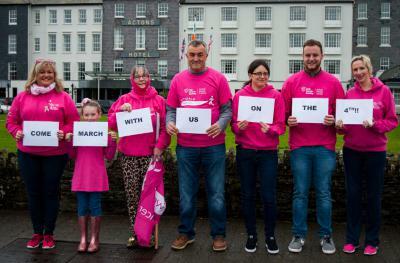 Since the first Irish Pink Ribbon Walk in Kells in 2009, and subsequent annual walks in Killaloe and Kinsale since 2012 and Kenmare in 2014, many more men have joined and some enjoy running the route – all raising money for Action Breast Cancer. All ages are welcome but we ask that those under 12 years of age are accompanied by a responsible adult. -How much does it cost to take part in the Walk? entertainment with our walk Ambassador Sharon Crosbie and Band at Actons Hotel. -How fit do I have to be? It doesn't matter if you are an experienced walker or have never done anything like this before as long as you put in the training. The Walk is designed to be challenging but achievable. There is plenty of time to train and we offer training advice to participants. The Walk is not meant to be competitive; it's all about having fun and experiencing a sense of camaraderie, whilst raising money for charity. You can register online up to Saturday April 7th or pick up a registration form from Collins Pharmacy & O' Connors Pharmacy Kinsale , Co Cork. Please pay your €20 registration fee in advance. Registrations will be accepted on Saturday April 7th at the Temperance Hall Kinsale and up to 11.30am on the day of the walk, but please register online if possible. Thank you! -How much sponsorship do I have to raise? Each participant is asked to try and raise as much sponsorship money as you can (in addition to the €20 entry fee). 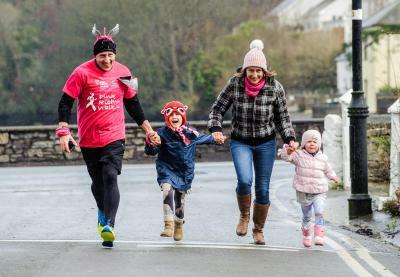 The success of the Kinsale Pink Ribbon Walk's fundraising over the past six years has been due to walkers' and runners' commitment to raising on average of €100 per person. As we are all volunteers, every euro goes directly to Action Breast Cancer. €350 provides an Irish Cancer Society Night Nurse for a night to care for cancer patients across the country in their own home during the last days of their life. -Can I get advice on how to raise funds? Take a look at our fundraising information and tips for help and ideas about how to raise funds for the Walk. -Where do I get my t-shirt and race number? Collect your t-shirt and race number on the Check-In Day at The Temperance Hall between 12.00pm and 6pm on Saturday April 7th 2018. Collect your t-shirt and race number on the day of the Walk between 10.00am and 11.50am at The Temperance Hall, Kinsale. If you are choosing this option, please get there early to give yourself enough time. -How do I hand in my sponsorship money? 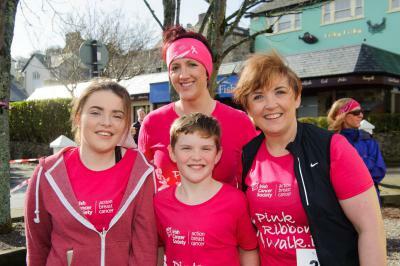 Cheques and postal orders should be made payable to Kinsale Pink Ribbon Walk. Please make sure your sponsorship card (with your sponsorship total written on the front) and sponsorship money are in a sealed envelope with your name , contact number and sponsorship total printed on the front. -Can I help publicise the event? We will have flyers, posters and extra registration forms available to anyone who is willing to help us spread the word about the Walk. Please like, tag and share our posts on Facebook and retweet on Twitter too! -If I can't take part in the event, is there another way that I can help? -What time does the Walk start? 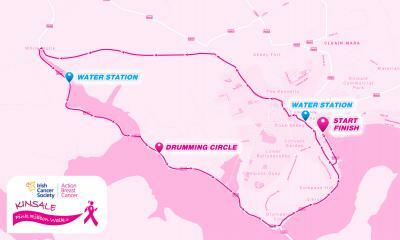 Both the Kinsale Pink Ribbon Run and Walk will start at 12 noon. We ask those that intend to run to be first at the start line. The venue will be open to the public from 10.00 am. We ask that you arrive in plenty of time and that you are on site at least 45 minutes before your event begins - that's 11.15am for runners and walkers. We have plenty of pre-event entertainment and a warm-up at 11.30am. -How do I get to the Town Car Park? The Town Car Park is in the middle of the town, along the Pier Road (just in front of Acton's Hotel and Fishy Fishy Restaurant). You won’t miss us – there will be plenty of pink balloons! -Will car parking be available? There is free public parking in two large car parks at the Glen (400m behind the Blue Haven Hotel) and plenty of on street parking around Kinsale town. We suggest that people from Kinsale take a lift or car pool, allowing more space for visitors. -What is the route like? 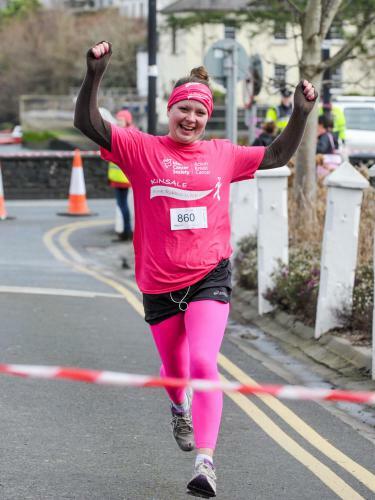 The Kinsale Pink Ribbon Walk takes in parts of the town, some leafy country roads and a picturesque route along the River Bandon coming back into Kinsale where the river meets the harbour. There is a challenging uphill climb when we go through the town to get us up onto the Bandon Road, but it’s only about 500m and it’s downhill or on the flat when we reach the 2km mark! THINK PINK - wear your Pink Ribbon Walk t-shirt and accessorise accordingly! Remember, there'll be a prize for the best-dressed Walker and Team! We'll also be on hand with solutions for all weather eventualities including pink rain ponchos! We do recommend sturdy walking boots and comfortable clothes though! -What support will I be given on the route? 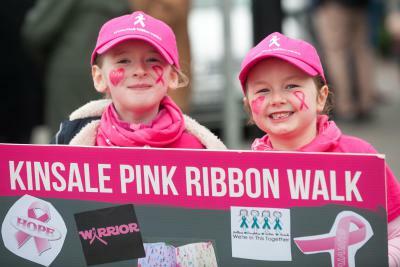 Pink Ribbon Walk signs will be clearly placed all the way along the route and you will be well supported and guided throughout the Walk by our Stewards. Please do listen to any advice or guidance they may offer you, as they are there to ensure you enjoy your day. To help identify participants, we ask that everyone wears their complimentary Pink Ribbon Walk t-shirt. -Will there be any toilet facilities available? Toilets will be provided at the start/finish areas and there will be a rest stop midway along the route. -Will there be any food or refreshments provided? Our sponsors, The Silent Banjo and Ballinacurra House will provide refreshments along the route, and The Kinsale Good Food Circle.Ballygowan Water will have some delicious refreshments for you on your return in Actons Hotel . -Will litter bins be provided? We will have plenty of litter bins and skips on site. Please remember to leave nothing behind but your footprints! -Where does the Walk finish? The Kinsale Pink Ribbon Walks takes a looped route, so you will start and finish at the Town Car Park along the Pier Road, Kinsale. -What will happen when I finish? -Is there somewhere nearby where I can stay? Any participants who wish to stay locally the night before or the night of the walk can find accommodation information to suit every taste and budget. Kinsale is renowned for its good food and has a wide range of cafes, bars, restaurants and hotels, so why not make a day trip or weekend of it? www.kinsale.ie has a number of hotel, B&B and self catering accommodation listed as well as cafes, restaurants, bars, shopping and additional activities. Check out pink offers at various hotels on this website and our Sponsors, the Kinsale Good Food Circle will be organising pink promotions so check out www.kinsalerestaurants.com for information on best dining options. Kinsale always enjoys a party and we are looking forward to plenty of celebrations after the walk in Acton's Hotel. -Is the Walk accessible for wheelchair users? Unfortunately, the Walk is not accessible for wheelchair users. -Can I bring a pushchair? As there are some less accessible sections, we cannot allow children or pushchairs on the route. -Can I bring my dog? The Kinsale Pink Ribbon Walk is not suitable for dogs so we would appreciate if you would leave them at home.